i also want the diamond bracelet ..... my purpose is different from yours. I just need the metal, melted it to make into a hook to hang my broom in the kitchen. As for the diamonds, i can sell it "cheap cheap" to you. Hey Terry, when/where is the early registration taking place? do i go though you or call them? You can book thru the link below froggy. Just leave your nick and name on the thread. Person to contact is in the link as well. As for your suggestions it is a great one. But unfortunately we are not able to offer the 10k starting stacks if it is a 2 day event. We definitely will not be able to finish in time for everyone to get off the boat by Sunday night. For the CNY tournament the one with the $888 buy in, we will be looking to do a 3 day main event and will probably start with 10k in chips. Most important it is the blind structure, ours is a very long structure with steadily increasing blinds like the rest of the major tournaments around the world. 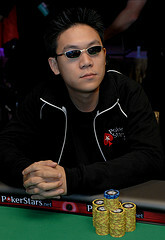 Unlike those like the Genting tournament, which is more for gamblers. They could in theory give 20k in start stacks and finish in under 8 hours since their blind structure always doubles. There is 0 value for poker players, cos the skill factor is tremendously decreased. Btw, have you pre-registered for the event? You should do so to enjoy all the special benefits LW is offering. cianopher , what are you waiting for? MJFX wrote: cianopher , what are you waiting for? huh? yes im confirm going. Can someone enlighted me on this? If assuming i m going to travel from Singapore. How much is the total that i need to pay if i just want to play the main event? Maybe can put it in the main page so everybody has a clear picture on this too. It confused me when i read about this (below), do we pay the ferry ticket to batam as well? Assuming that i will be travelling from Sg. 60 (ferry ticket) + 60 (ferry cabin) + 400 (tournament fees (main event). SGD 520. is this the amount of money i need to pay if i only want to play for the main event? Is there any GST or additional charge or batam ticket? your help on this is really appreciated. No. You don't need to pay any additional ferry during the transition from batam jetty to Leisure World cruise. $42 (ferry ticket) + $60 (ferry cabin) + $400 (tournament fees (main event). There is no GST charges at all.